TADSummit is 5 years old, while the first event focused on the emerging technologies of Telecom APIs (later called CPaaS, Communications Platform as a Service), WebRTC, open source telecom software, API management, and the vertical applications of those technologies. Today the focus is on understand what programmable telecoms (the collective noun for all the enabling telecom technologies) means for your business. It is becoming mainstream, though there is much education required, as we’ll discuss further. 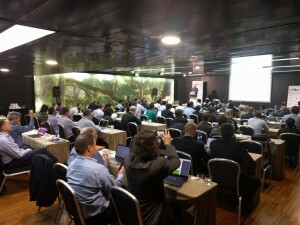 In this weblog we review the first half of the morning session of TADSummit Day 1. Another comment from someone who last attended TADSummit in 2014 in Istanbul was, “where have all the telcos gone?” In person we have a few from DT, KPN, Telefonica, and a few other telcos viewing remotely, e.g. BT, O2, Vodafone, AT&T, and Telstra. Traditional Telco involvement is down but xVNO involvement is way up, and that is an important observation. TADSummit is the telecom service innovation event, and traditional telcos are simply not that focused on service innovation anymore; rather obsessed on continuous transformation and waiting for the promises of 5G. Frankly sharing my experience, all developing market telcos should be working with hSenid Mobile to repeat the success of Sri Lanka; I’ve provided loads of intros. Instead they select Huawei and end up with stalled projects. Change rarely happens with the same people, processes and technologies; you have to change them all! The theme of people was also apparent at TADSummit, we have several attendees that have changed company. Naming just two: John Elliott from Tropo to Cisco to Ribbon Communications (Kandy), and Harold Vance from Tropo to Cisco to Telestax. Its the people that are critical to innovation, there are just some that can in the right environment (process and technology) make cool new stuff happen. MVNO Service Success. While telcos remain trapped by their strategic vendors and institutions (GSMA and TMF), xVNOs are driven by solving problems for their customers. They have adopted programmable telecoms, and achieved impressive success, as reviewed through TADSummit. Innovation Showcase, led by DataArt. Showing what is possible today from IT innovations for programmable telecoms. MONEH Showcase, led by the inimitable James Body. Telecom networks are mostly software, even the RAN, opening up many new opportunities as Dean Bubley (Disruptive Analysis) and Patrice Crutel (Cap Gemini) review in their presentations. Application to Person Service Showcase. Demonstrating the sophistication beyond message passing in conversational CRM. Programmable Telecoms in the Enterprise. From enterprises who also share the real-world processes they use for making innovation happen. Not the silly gumpf we see from the TMF. Decentralized Web / Decentralized Telecoms / Network App Store / Neutral Hosting. We wrapped up the presentations with David Dias providing an update on the distributed web. IPFS, Filecoin, and the many other protocols and technologies being created for the distributed web must be considered by all service providers. Network Services Built for the Cloud. Dean coined the phrase CPaaSaaS. The MONeH Showcase showed its impact in mobile networks. The convergence of telecom and IT mean we must be aware of latest IT developments to be competitive in programmable telecoms. TADHack service successes. Utku from Garanti showed a great example of a hack from TADHack being deployed within months in the bank. Accelerating Programmable Telecoms. A common theme is there remains much education required in the market, currently its not about competition rather education of enterprises and delivering solutions to their problems. I’ll do a wrap up weblog on all the findings and insights from the event next week. Over the next couple of days we’ll review the presentations so you can easily access all the content. Most conferences are not open, they do not make the content created available online with analysis, as they repeat most of the same content in the following year. At TADSummit we’re open, its all laid bare for anyone interested to review and understand. I reviewed all the M&A we’ve seen in the TADSummit sponsors, there’s much M&A tacking place at the moment, and more to come across the programmable telecoms sector. I reviewed the successes of TADHack through 2017, and the impressive hacks created, some of which are moving into real world deployment. TADHack delivers demand generation in programmable telecoms. My parting thought was the world’s first MVNO began 18 years ago in 1999. Today virtualization has gone further. No longer does a service provider need to own a network OR resell network services. Its all just IP and you/customers define the services. Dean disagreed with the “no longer need to own” as enterprises can own networks and spectrum, and we are seeing that happen, as we’ll share in later in this year’s TADSummit presentations. For the majority of service providers there is no need to own a network (though it is an option) to deliver far better solutions to the problems people and businesses face, than the poor old telcos can given their obsession on ‘continuous transformation to nowhere’ and the ‘promise of 5G’. Innovation Showcase chaired by Michael Lazar, VP Telecoms Practice, DataArt Solutions, Inc.
My day job is consulting in high tech, I’ve done numerous projects over the years studying the latest developments in IT / Web, the industry landscape, and what that means to telecoms. When telcos ruled the roost in telecoms, it was either ignored or bastardized into a telco-specials like NFV. Today given the much broader telecoms market we’re seeing a much more open adoption of those IT technologies across xVNOs, service providers and enterprises. Linking to the principles of Effectuation, which you’ll see later, use what’s in the fridge, rather than standardizing a new telco-fridge and telco-contents because of perceived special telco requirements. All the demonstrations given are world-firsts that can be deployed today or in the next 6 months. Achieving Amazon and Google Cloud economics with Immutable Diskless Compute Pool for zero-time provisioning, using a Ceph-based storage open source solution. Containerization of Telecom Services, moving beyond network virtualization into operational savings for Telecom services through open source containerization like. As access revenues flatten services will again become critical to growth. Leveraging containerization can lead to drastically lower operational costs. Put simply what takes days today in spinning up an environment is now takes minutes. A new billing solution for tomorrow’s applications. Based on Ethereum we will show an efficient billing system that can accurately track subscribers’ use of services and instantaneously charge usage. The solution is designed to streamline complex billing relationships and enable Enterprise class applications to leverage Telecom environments. Leveraging Omni-channel CRM Chatbots with Skype. Utilizing two-factor authentication, an advanced chat bot for the health-care market which includes voice transcription for compliance. VNF (Virtual Network Function) testing and “validation” as a network service for providers. NFV provides opportunities for providers to decrease time to market for new services and save money when rolling out an and managing the services. This will show a solution allowing providers to bring in VNFs and provide a flexible testing and validation framework. Today telco labs are testing 1 VNF a month, this bring is down to hours or a few days. This part of the innovation showcase was not shown because of time, but is shown here, a showcase of mobile device testing.